Can you graduate Kindergarten? 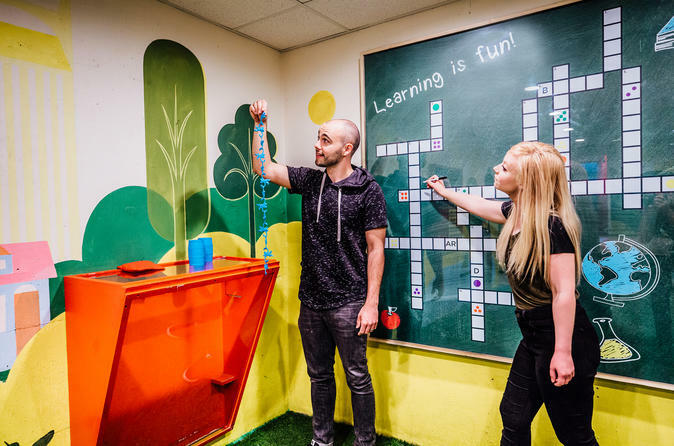 Located in the Berry Hill neighborhood of Nashville, The Escape Game offers an escape from ordinary life and allows you to live the stories you love. Here’s how it works: You and your team are locked in a room and have one hour to complete a mission and escape. Escaping will require teamwork, quick thinking, determination and a sense of urgency! In Underground Playground, you'll need to make it through recess in order to graduate Kindergarten! Located at 510 East Iris Drive in the Berry Hill neighborhood of Nashville, please check in 15-minutes prior to your game start time. Our Underground playground Escape Room is an exciting, immersive adventure that takes you back to the days of your youth. This game is more than just ABC’s and 1-2-3’s, and accommodates up to 12 players. So get your favorite sidekicks together and test your wits in a room that is anything but Elementary. Fail to escape and you’ll be repeating Kindergarten!